Posted March 22nd, 2019 by Crisis Centre & filed under News. 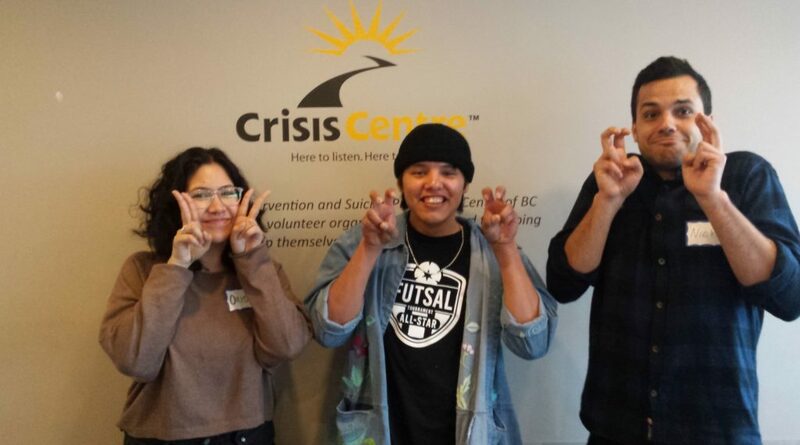 Nine lively youth and their youth workers from N’Quatqua First Nation spent an afternoon at the Crisis Centre to attend wellness workshops on March 20. The group’s two-day road-trip from D’Arcy, B.C. included a supportive mix of mental health and mindfulness education workshops shared by up-beat Crisis Centre volunteers, plus a healthy dose of activities to ensure a memorable experience for all. My day went fantastic here with the Crisis Centre and I would recommend it to anyone who is feeling unsure of how they feel or even if they feel lost and hopeless. I had no idea how beneficial and how opening mental health information and self-care could be for myself. I’ve always believed mental health stood out as a negative feeling or topic. The Crisis Centre works in collaboration with First Nation communities and our neighbours throughout the Province to provide a variety of youth programs that build skills and knowledge to foster healthy coping and lifelong resiliency. Find more information on our website about youth programs, as well as training and resources for community members, teachers, service providers, counsellors, other professionals.